Guillotine® EC19 PRO V2 110 Volt Electric Stack Paper Cutter. This digital, multi-operational, programmable electric paper cutter will cut a Stack of 20lb paper up to 2.1" or 500 sheets. It has a 18.9 inch cut width and length, plus it comes with multiple safety features which include: Invisible 6 Beam Infrared Safety Grid, Rear Safety Cover, Emergency Stop and Two Cut Button Operation (requires both hands to push cut buttons for machine to cut). The Guillotine® EC19 PRO V2 Electric Paper Cutter is ideal for Schools, Churches, small and large Businesses, Print Shops and much more. Easy electronic cut lengh adjustment. Powerful one horse power motor. Digital, Multi-Operational, Programmable Control Panel. Professionally machined and assembled steel blade. Rear safety cover to prevent fingers getting near blade during operation. Quick push emergency stop button. Two cut buttons for two handed operation. Paper cutter is pre-assembled and easy to use (stand does require assembly). 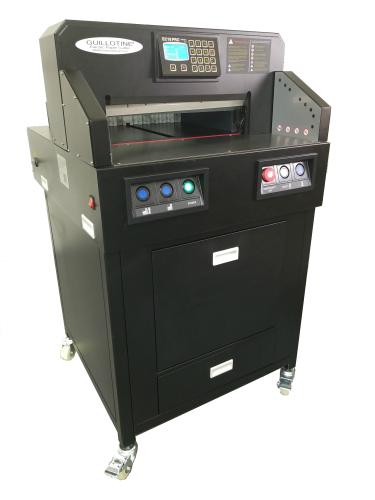 Laser Cut Line for quick, approximate cuts - This laser line is used for quick, approx. cuts only. It is not designed for accuracy. It's for a quick cut that does not need to be perfect. MBKP International agrees to repair or replace, at its option, any defective part or component covered by this warranty, provided there is no evidence of abuse and we first receive written notice via email of a defect within the applicable warranty period. Maintenance, adjustments and any labor costs are not covered under warranty. Wearable items are not covered under warranty. Wearable items include, but are not limited to; cutting blades and cutting pads. This warranty extends only to the original purchaser. MBKP International makes no further warranty of any kind and specifically disclaims any warranty of merchantability for a particular purpose. Do Not connect this cutter to any type of DC backup power units. Doing so will void your warranty as it will cause problems with your cutter and possibly damage it. Repairs done by us would require the cutter to be shipped back to us or we can ship parts to you, for you to replace the defective part. If you decide to replace a defective part yourself, MBKP International is not responsible for any injuries that may occur while repairing this cutter. We highly recommend you use a qualified professional to replace any parts. Should you decide to return the cutter to us for repair, you would be responsible for making sure the cutter is properly packaged and insured for shipping. We highly recommend that you keep all packing materials for future use, if needed. Paper Cutters can be returned for a refund for 30 days from date of purchase. Buyer is responsible for all return shipping and packaging charges. Please Note: Do not purchase this machine if you are not capable of doing your own maintenance and or making your own adjustments. By purchasing this machine you understand and agree that we do not offer any type of service or repair at your location. Any maintenance, adjustments or repairs that you cannot do yourself (or with the help of us via email and videos) will require the machine to be sent back to us for repair as mentioned above. The owner of this machine will need to be able to do their own maintenance such as adjusting the paper push, replacing or adjusting sensors, keeping moving parts lubricated, replacing a part, tightening nuts and bolts, replacing blades, cut pads, belts, etc..